Constant method thresholds the image intensities with the given value. Image intensities go from 0 to 1. Otsu's method thresholds the image intensities so that the intra-class variance is maximized. The calculated threshold value can be multiplied with a correction constant, to improve the result. Shape method thresholds the image at several intensity levels and searches for objects fitting the size and roundness criteria given in the parameters. ConstantArea method thresholds the image at several intensity levels and returns a mask where a certain ratio of image area is included in the mask. Filling/size restrictions are applied after masking. Use constant to control the area ratio. A minimization function is used, so the area fraction may not be accurate. 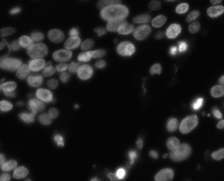 KMeans method thresholds the image intensities by performing k-means algorithm on the intensities, and by sorting the clusters in cluster center order. Snake method, or Active Contour method, uses an iterative method to find edges from an initial guess. Uses ellipses as seeds for finding the actual objects. Algorithm implementation copyright (c) 2010, Ritwik Kumar, All rights reserved. BSD License. 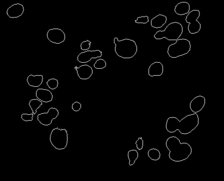 Correlation method thresholds based on two grayscale images, where threshold level lies on the linear regression curve, and the correlation coefficient for pixels below the treshold is less than 0. Grid method creates a grid of constantxconstant pixels, with a spacing of 1 pixel around each square. opt ImageList Optional A directory with grayscale image files used in Correlation method. seed MaskList Optional Masklist of objects as initial guess for the 'Snake' method. e.g. 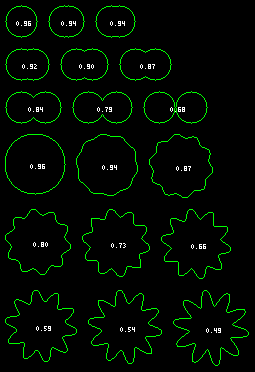 output from Ellipse2Masklist. numbered ImageList BW PNG images of the numbers of the objects in the mask. Created only if parameter numbers is set true. masklist MaskList Image folder structure describing each object. One folder of images for each source image. clearBorders boolean true Clear objects touching the image edges. Applicable to all methods. clusters float 2 Clusters for KMeans method. The result mask will have as many gray scales as cluster number. Results with number higher than 2 will not be compatible with the feature measurements components, and object numbering doesn't work. constant float 0.5 Constant value for threshdolding the images, for 'Constant' method. Range 0 to 1. Also, the area ratio in ConstantArea method. corr float 1 Correction multiplier for threshold value in 'Otsu' and 'Correlation' method. fill boolean true Fill holes in segmented objects. Applicable to all methods. maskList boolean false Produce masklist entry for each object. Forced true with 'Snake' method. maxArea float 0 Maximum accepted pixel area in all methods. 0-1 is considered as ratio of image size. Use 0 for no limit. maxRound float 1 Maximum accepted roundness value. 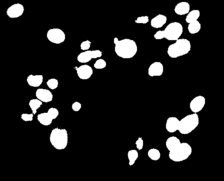 method string "Otsu" Method for image segmentation. Choose from 'Otsu', 'Constant', 'Shape', 'ConstantArea', 'KMeans', 'Snake', 'Wavelet', 'Correlation', 'Grid'. minArea float 0 Minimum accepted pixel area in all methods. minInt float 0 Minimum accepted intensity value in 'Shape' and 'Otsu' method. 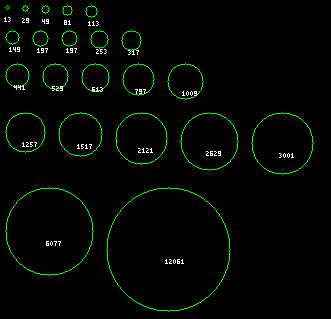 Ranges 0-1.
minRound float 0 Minimum accepted roundness value. numbers boolean false Draw images of the numbers of the objects in the mask. This can be a lengthy process if there are huge amounts of objects. iterations: No. of iteration for which snake is to be moved.